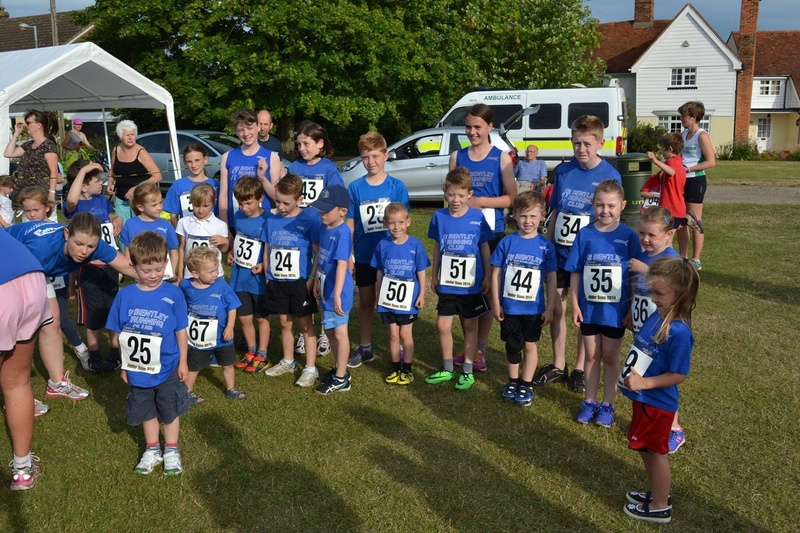 Great Bentley Running Club hosted the last in the summer Friday 5 series of races on Friday 4th July. 8 Blue Vests ran this fast, flat course. Simon Dale was 12th to finish in 29 minutes exactly. Phil Presland claimed a new PB by 37 seconds in 36:04, while Eric Shaw, who has run consistently throughout the series took just 39:46. Frank GRdiner finished in 41:21, Gary Hill 41:40(PB), Mark Crittenden 45:50 Nicola Thornton 50:26, Sue Thomas 52:03 and Rita Page 1:00:00. A huge turnout of 20 GBRC children ran the junior races. New for this year was a completely new 2k course for the 9 years and over age group, with the traditional 1 k course reserved for the 8 years and under. Harrison Leek carried the flag for Great Bentley, winning the under 9s race in 5:07. Samuel Parry came 3rd in 5:09. Other runners in this event were Bobby Neill 5:42, Harry Booty 6:33, Tegan Dale 6:34, James Blacker 6:39, Alex Hill 6:45, Alice Dale 6:57, Katie Stevens 7:34, Elisha Warren 7:46, Lucy Warren 8:21, Charlie Sharp 9:18, Connor Sharp 9:18 and Ella Grace Simpson 9:49. In the 9 years and over event, Katie Presland came in 7th place in 8:46 and Michael Oates 10th in 8:59. Other runners were Michael Knowles 9:49, William Thorpe 10:15, Oliver Hill 10:23, Eloise Parry 12:00, Hallie Booty 12:04 and Aimee Apps 12:08. Charlie Keitch ran the Bewl 15 on Sunday 6th July. This tough multi terrain course winds around Bewl Water up and down hills. Keitch finished in 1:48:38, a new PB.